The Minnesota Twins were the highest-scoring team in the American League in 1965, so even though the Dodgers — winners of 15 of their final 16 regular season games — were listed as a favorite to win the World Series, Twins manager Sam Dele was undaunted. “We don’t expect to lose,” Twins manager Sam Mele told a reporter, according to Charles Maher of the Times. The reporter kept looking at Mele, expecting him to go on. The reporter wrote it down. Though the Dodgers had Sandy Koufax and Don Drysdale, not to mention several other tried-and-true World Series veterans compared with the inexperienced Twins, the Los Angeles offense remained a concern. “If a guy like (Maury) Wills scores only 92 runs, it must mean he is not getting driven in much,” Mele said. As it turned out, the one thing the Dodgers didn’t really worry about betrayed them. 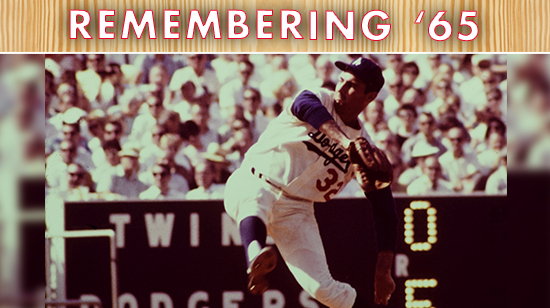 Fifty years ago today, on October 6, 1965, Drysdale was knocked out of Game 1. Taking a 1-0 lead into the bottom of the second inning, the 29-year-old righthander, who had a 0.56 ERA in two previous World Series starts, allowed a game-tying home run to Don Mincher, then was battered in a six-run third inning on the way to an 8-2 loss to the Twins. Everything went wrong in that third inning, beginning when No. 8 hitter Frank Quilici (who had a .255 slugging percentage in the regular season) doubled down the left-field line. Twins pitcher Mudcat Grant bunted, and Drysdale slipped while fielding it, throwing to first base with a bounce that Jim Lefebvre couldn’t handle. The next batter, Zoilo Versalles, lined a three-run homer into the left-field stands for all the runs the Twins would need — not that they were done. Three hits and a walk followed, and when Quilici got his second hit of the inning to make the score 7-1, Drysdale’s day was over. It was the most runs the Dodgers had allowed in an inning all year. Alston was second-guessed after the game for not pulling Drysdale sooner. Koufax watched Game 1 on TV after attending Yom Kippur services at a St. Paul synagogue, according to the Times. The Dodgers would place their hopes of evening the Series in his hands the next night. I remember that awful start, I believe it was during the time of the World’s Fair. Gee, you mean that 50 years ago, people were saying the Dodger manager was a genius when the team won and an idiot when the team lost. It’s good to know that some things don’t change.